How will donating books help trafficked teens? Many teens are lured into human trafficking due to poverty. Poverty often stems from a lack of education. You can break the vicious cycle of generational poverty by helping us to encourage our trafficked teens to read to their young children. Statistics shows that children who are read to at an early age tend to do better in school and will graduate from high school. At Free the Captives, we believe that if someone had taken the time to read to our girls when they were young, they probably would not be trafficking victims today. I have a ton of books that my children have outgrown. Can I donate them? They are in great shape! We really appreciate you thinking of us! But we are seeking brand new books for our survivors and their children. Many of the children are infants and toddlers, and we are asking mainly for board books that have touch and feel parts to them. Board books tend to harbor germs. Can I just drop off 20 books at one time? Why once a month? We want you to be intentional about your book giving. 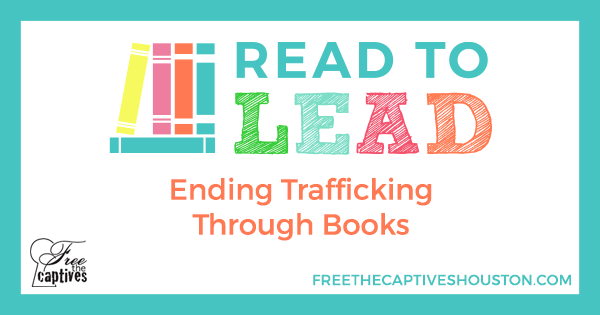 Read to Lead is not about how many books we can collect, but it is about the number of people intentionally thinking about and praying for our trafficked teens and children each month. Our girls desperately need your prayers. They don’t have parents who pray for each them night. We hope that by buying and donating one book each month will serve as a reminder to pray for this teen and her young child. They need your prayers and support. Will the trafficked teens get to keep the books? Absolutely! They will get approximately 10 books every two weeks and start building up their very own libraries. Research has shown that just the mere presence of books increases the likelihood of a child doing better in school. Can I get books that are not on the recommended reading list? Please try to get books on this list. All of these books have been either approved by librarians, literacy experts, or children themselves. We have very limited storage space and would like to provide these particular books. Why do you want Walmart gift cards? Can I donate Target gift cards? To provide incentives to the girls, we are providing Walmart gift cards to them after they have read 20 books to their child in a two week time span. We are specifically requesting Walmart gift cards because these stores are more accessible than Target stores for our trafficked teens. Many of them would have a hard time getting to a Target and using the gift card. Lack of transportation is a major issue. Yes, you can! When you drop off books at our book drops, there will be forms for you to fill out and turn in with your donation. Alternatively, email us at info@freethecaptiveshouston.com for a tax receipt. Can I mail the books instead of dropping them off? Yes, books can be mailed to Free the Captives, 2211 Rayford Road, Suite 111-418, Spring, TX 77386. Can I donate money and have Free the Captives purchase the books for me? You sure can! You can make donations online here, and we would be happy to buy books that have not yet been purchased.